Khruu Rachael Marshall, graduate of the SomaVeda® Thai Yoga Teacher training program and Certified Advanced SomaVeda® Thai Yoga Practitioner co-facilitates the 200 Hr. 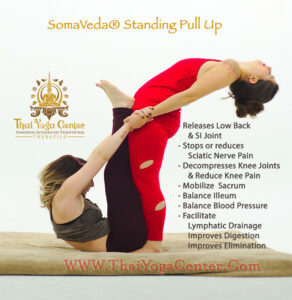 SomaVeda® Thai Yoga Practitioner Certification Program. Khruu Marshall is currently enrolled in the SCNM Ayurveda Doctorate (PhD) program at the SomaVeda College of Natural Medicine: School of Ayurveda. Additionally, Khruu Marshall is Staff/ Faculty at the Humiovi Thai Yoga School in Knoxville, TN where she teaches regularly and has a NAIC Authorized Ayurveda, SomaVeda® Thai Yoga and Healing practice. As an Ayurveda Wellness Counselor. A session begins with an Ayurvedic medical assessment, including discussion over physical, emotional issues as well as nutrition/diet and lifestyle choices. With this information, I am better able to customize a program to meet each client’s unique and individual needs. This introduction between client and therapist is followed by a general whole-body balancing session for the purpose of basic ‘house cleaning’ and a hands on assessment. I can also teach you this wonderful healing modality. I hold regular classes through out the year. If you don’t see a date feel free to email me and we can get you registered.